INDIAKA® was created after cyclamen breeder, Guy MOREL did a great deal of research on cyclamen colours and hardiness. It took 15 years of work on colour vibrancy, original contrast and the plant’s shape for this latest plant from the Morel family to make its appearance! The vibrant colours of this cyclamen immediately made us think of the feathers used in the INDIACA game. That is how it got its name. Find out more about the name. The Morel family, innovation and diversity! 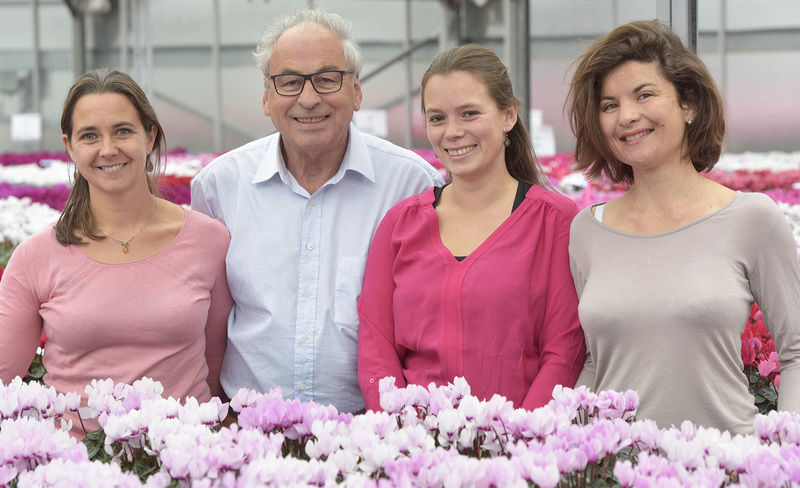 The Morel family, breeder and grower of Cyclamen is passionate about floral diversity and innovation. In addition to its classic varieties loved around the world, it has created several original fancy varieties in vibrant, joyful colours. There are more than 179 varieties of Morel cyclamen, spread over 6 groups of plants. Morel owns the national collection of Cyclamen, officially awarded by CCVS* (*CCVS: Conservatoire des Collections Végétales Spécialisées [Conservatory of Specialised Plant Variety Collections]). In recognition of the quality and the diversity of the Cyclamen varieties created. This certification testifies to our commitment to environmental conservation and our contribution to biodiversity. DISCOVER FOUR GENERATIONS OF HISTORY OF THE MOREL FAMILY! Morel Cyclamen are notable for being exclusively bred and grown in Fréjus, in the South of France, which makes them unique for their heat resistance. Charles Morel’s first hybrid cyclamen were introduced in 1989, and have now built an international reputation. This know-how of more than 95 years in breeding flowers, shows how reliable and dedicated the company is, not to mention the quality of its work.